I wasn't very familiar with this character until it became subject for a drawing jam. It turned out it was actually fun to draw, so fun that I had to do another drawing of him (it?) after the first one. In each image there is also the lose rough sketch that I use as starting point when drawing these pieces. 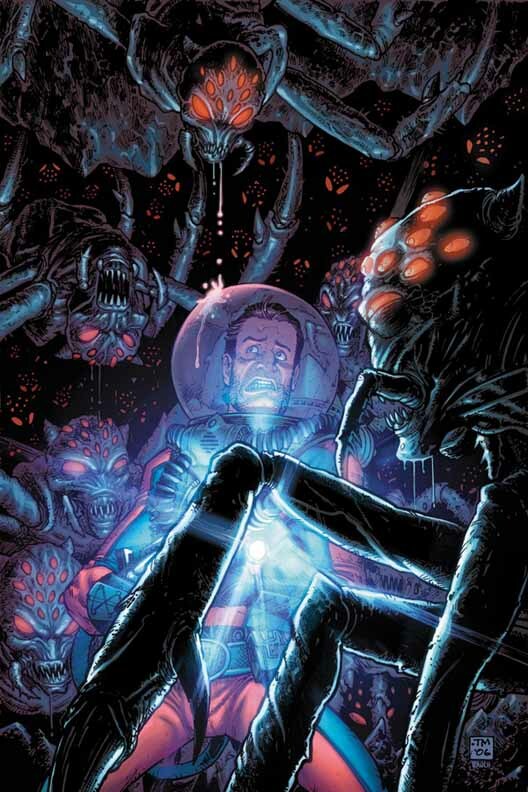 The solicit for Fear Agent #11 is now available. Rick Remender wrote an incredibly amazing script that was a pure joy to draw. Although I feel sorry sometimes for poor Heath - the things he has to go through. Written by Rick Remender, art by Francesco Francavilla, cover by Tony Moore. An issue long "Tales of the Fear Agent" illustrated by legendary Italian illustrator Francesco Francavilla! A population of human flies pays Heath to protect them from a race of spiders slowly taking over their world. However, when Heath becomes impregnated with the spiders' eggs he becomes the planet's greatest threat. When my wife read the part about the "legendary" illustrator, she fell over laughing and suggested to hire Rick as my publicist. Thank you honey - I love you too!! Tony Moore did a very nice cover for this issue. It's like the cherry on a pie baked by Rick and me (do you have this saying in English?). I am excited to see how looks this issue in print. And now page 3 of the Prey (there will be a page 1 and 4 - I will update you on that). I have to show you what happened to hex after that last panel on page 2. I'm working on this short story that will be published in full-color (I am doing rough pencils, inks, and colors for this). I'm working a bit differently here than I do for Black Coat or Fear Agent; the page size is 9x12. I'll post more later, but for now, here is a closeup of a couple of panels. OK, so anybody who knows me saw this coming after that first Jonah Hex quick sketch of 2 days ago... I roughed out a short story that is titled "The Prey," and will post the remaining pages soon. As I said earlier, I'm in some mood for good westerns. I, like most Italians, grew up reading the king of all western comics, Tex. I remembered that I did some cool sketch of Tex for a jam on the Drawing Board last year and decided to find and share the pic. Tex (last name: Willer), was created by Gianluigi Bonelli (father of the actual owner of Bonelli Editore, the publisher of Dylan Dog, Nathan Never, and Martin Mystere, just to name few) and Aurelio Galeppini in the far 1948. In strips first, and in comicbook format later (since 1958), Tex has been one (if not the one) of the most popular comics loved by several generations of reader and started what it became the "Italian" format or standard for comicbooks. Tex is a ranger that has been in thousands adventures since 1948 with his pards: Kit Carson, Tiger Jack (a native american) and his son Kit. For some reason lately I've been fascinated with the idea and myth behind the western (see previous Zorro posts). Although many think of this as a uniquely American genre, my own influence came from the Italian 'spaghetti westerns' that I saw so much growing up. Combine this influence with my love for very strong black-and-white contrast, and I guess this is what you get. Hope you enjoy. As promised (or requested) here the second page. It might be awhile for the third one because I am pretty booked right now. I've been inspired lately by the Zorro jam going on over at the Drawing Board. I'm so inspired that I can't stop at a few sketches, so I decided to take some of my initial ideas and flesh them out into a short story. Hope you enjoy!! Damn I love drawing Zorro. Here's a couple of preview pages from the Fear Agent book I am drawing (as spotlighted in the Newsarama interview that went up while I was in San Diego http://forum.newsarama.com/showthread.php?t=77435 ) plus a new panel from last week.